Chea – Brave And Courageous – And Extremely Determined! Home » Blog » Posts » Chea – Brave And Courageous – And Extremely Determined! This post is by Lisa Altmann, Project Member – Cambodia. For all the Chea supporters out there, I am thrilled to tell you that he has breezed through his surgery and doing very well in the Intensive Care Unit. In fact he is doing so well that emergency distraction measures had to be taken to stop him pulling out his drips and tubes. Hi I am ICU nurse, Lisa Altmann. Originally from Adelaide, now living and working in Saudi Arabia, and on my 3rd OHI adventure in 12 months! Chea is an extremely determined little boy who doesnt give up attempting to get what he wants, perhaps due to the crazy life he has had so far. He didnt like having lots of tubes in and really tried hard to pull them all out. We couldnt turn our backs for fear he would succeed! So we gave him his bag of toys early and he forgot about the scary equipment and, instead, spent hours pulling out each individual toy, and then packing it all back again……and then getting everything out….and then putting it away….. 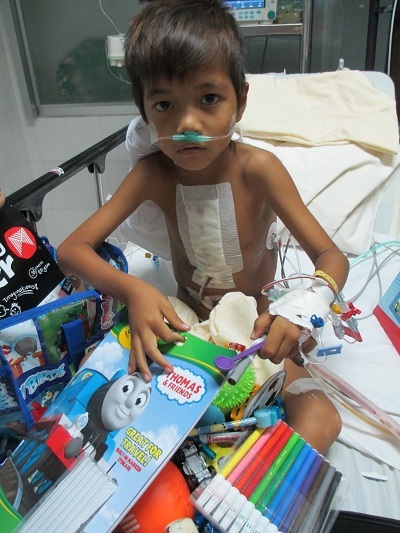 He spent the whole night with his bag of toys – and I could finally leave his bedside. 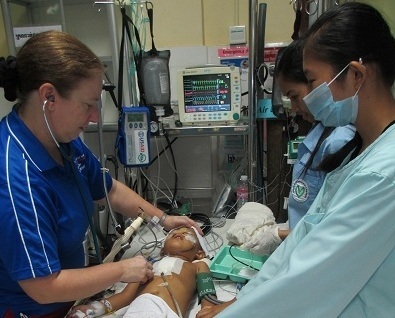 Thank you to all the wonderful messages from Australia, America and Cambodia to support Chea through his surgery. His operation is successful and he is moving around the bed extremely well despite all the tubes and drips still attached, and not to mention the pain he must have following cardiac surgery. He will be transferred from ICU to the surgical ward later today. 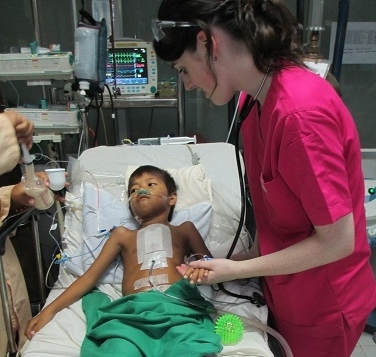 He is not alone in ICU – there are many other little friends in the same predicament, but maybe not as determined as he. 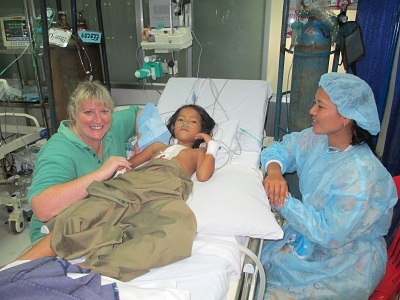 Pictured below are Lorraine Flynn from Perth and Jo James from Brisbane at work with the children operated on yesterday. All are doing very well.